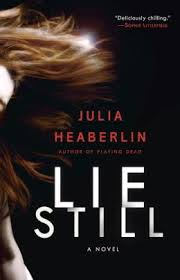 Lie Still by Julia Heaberlin is set for an early July release and is a Bantam publication. Emily and her husband Mike move from New York to Clairmont, Texas. Mike has taken the job of police chief here. Emily is expecting their first child and is constantly on guard because of several previous miscarriages. Her home is still a mess, with boxes unpacked when she is pushed a bit by her husband to accept an invitation to a party by one of the town's wealthiest residents. Emily reluctantly attends and finds herself in a surreal situation. The women attending this gathering are all very well off, dressed to the nines and catty. But, the hostess, Caroline, seems to be all powerful. She holds something over each woman and knows their deepest darkest secrets. As it turns out, Emily has a few of those deep dark secrets and somehow Caroline has found out about them. These are things that even Mike isn't aware of. When Caroline goes missing, there are an abundance of suspects. However, Caroline's disappearance could somehow or other be connected to Emily's past. Caroline, the keeper of others secrets, may have had a few whoppers of her own. For Emily this means opening up a chapter of her life she would rather forget. Emily and her unborn child are at risk from a stalker and maybe even a murderer. As Mike investigates the disappearance of Caroline, Emily begins to look into her past to discover who may have killed the man that raped her and several other girls and to find who is stalking her. She doesn't not know if the past and present are about to collide. This is a taut, dark, edgy mystery suspense novel. I could not put this book down. Once I read the first chapter I was hooked. The story moves fast with one revelation after another until you don't know who can be trusted. Everyone seems to have a sinister quality about them. This town is just plain spooky with some really off the wall characters. The wealthy group of women desperate to be a part of Caroline's club, the Mayor, the other policemen, the people in Emily's past, all have secrets, all have motives, all are not what they appear to be. Emily was a person that was easy to relate to. I felt empathy for her, and admired her courage. I also liked her husband, even at times when he was mad at her or preoccupied with his job. He was blindsided a few times and handled the big reveals from Emily better than I would have. I found myself feeling upbeat about the way things all turned out for Emily. I think that even though this experience was painful, she and Mike are stronger and Emily may now find the peace and closure she badly needed.I'm very impressed with this author and I highly recommend this book. A+ Thanks to the publisher and Edelweiss for this digital review copy!